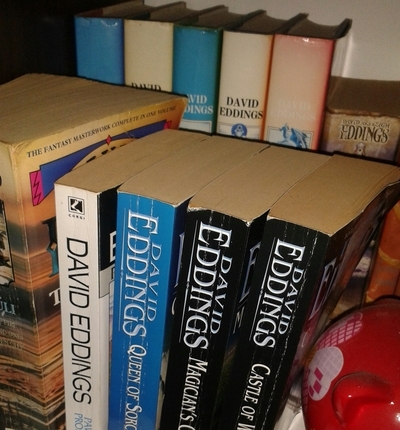 I have a shelf full of offerings by authors David & Leigh Eddings. I was first introduced to Pawn of Prophesy in the late 1980's by my father, an avid reader of fantasy fiction. I read the entire series in a very short period of time, swept up by the story of young Magician Belgarion and his mentors Belgarath and Polgara. The first pentalogy, The Belgariad, tells the tale of a young orphan being raised by his Aunt Pol, who, with the assistance of her vagabond father, keep the secret of Garion's true identity. During the course of the five book series Garion grows to become Belgarion, falls in love, fights all manner of evil and comes to realise his life is never going to the same. The second series, The Malloreon, is set in the same world as The Belgariad, but introduces more cultures and adventures in the eastern continent of Mallorea. Belgarion is now charged with saving the entire continent from the disciples of evil Torak, avoid assassins, protect his family and rule a kingdom, all whilst overcoming the Dark Prophesy. I quite literally read all of these books one after the other, and have reread them at least 3 times over the years. Eddings followed these two series with prequel's to delve deeper into the origins and characters of Belgareth the Sorcerer, Polgara the Sorceress and the The Rivan Codex, the holy writings of the various religions which exist in the stories. Prolific writers, between 1989 and the death of David Eddings in 2009, they completed a standalone fantasy novel, The Redemption of Althalus, and three more series of fantasy books, The Elenium and The Tamuli trilogies, featuring Sparhawk, a Pandion Knight with a past he'd rather keep to himself; and The Dreamers, a four-book series about the war fought between the Elder Gods. The beauty of the writing by David and Leigh Eddings is their ability to weave together an entire world, to bring it to life, to make the reader see the landscape, know the characters, believe what you're reading. There is evil, good, battles and romance. There are family, friends and allies who really shouldn't be trusted. Readers will laugh and cry, be amazed and horrified - all whilst witnessing an earth-shattering battle with the darkest of the dark gods. I first picked an Eddings book in a grocery store in the US while on a family trip when I was maybe 10 or 11. I didn't realize until we were back on the road that the book was part of a series, and I had purchased book two. I kept the novel, and bought all the books in the series a couple of years later. I read all of the Belgariad at age 13 and then again just last year. Wonderful books, and wonderful authors! That takes me back! I got started reading Edding's books when I was ten or eleven because a family friend left them lying around the house and told me not to read them. Looking back this may have been reverse psychology. I got sucked right into the lives of Poledra, Belgarion, Silk the spy etc, etc. When I compare them with other fantasy series like The Lord of the Rings, The Earthsea Quintet, The Tamir Triad etc. they seem kind of cheesy and silly to me, but I did really enjoy them while I was reading them and kept coming back for more and that means they got something right.